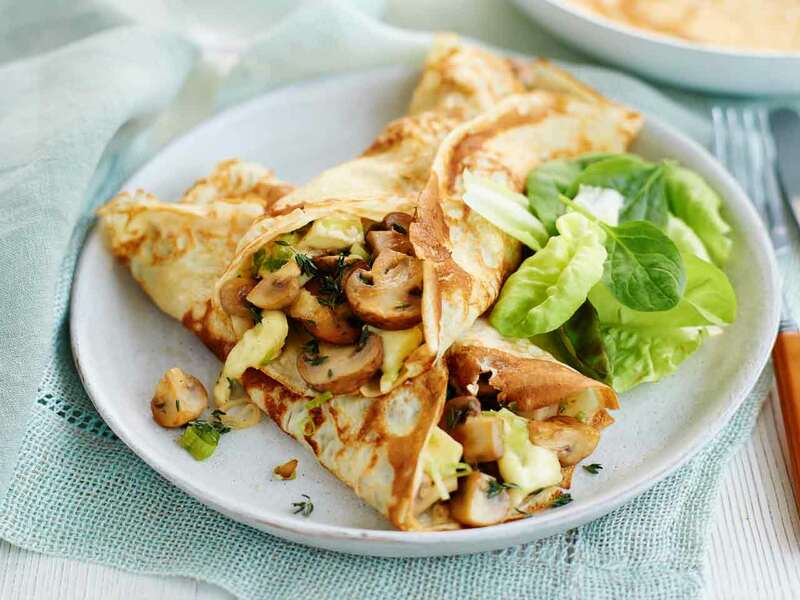 A savoury pancake filling made with garlic-fried mushrooms, white wine sauce and brie. 1. For the pancakes: sift the flour into a large mixing bowl. Make a well in the middle of the flour and add eggs with half the milk. Whisk until the mixture is lump free. Add the remaining milk and oil and whisk again until smooth. Pour the batter into a jug. Leave to stand for 10 minutes. 2. Heat a medium (20cm) frying pan over a medium heat and brush with oil. Pour in about 5 tbsps of pancake batter and swirl to coat the base. Cook for about a minute until deep golden, flip or turn and cook for a further 30 seconds. Repeat with remaining mixture to make 8 pancakes in total. 3. For the filling, melt butter in a large frying pan or wok, add mushrooms and cook over a medium-high heat for 5-6 minutes until golden. 4. Add onions, garlic and thyme and cook for a further 3 minutes. Pour in the wine or water and simmer for a minute before removing from the heat and stirring through the brie. 5. Spoon the mixture into the pancakes and serve with salad leaves. Our thanks to www.eggrecipes.co.uk for providing this recipe. Visit our pancake recipe section for more pancake filling ideas.